If I had to summarize my gear philosophy (you've got one of those, right? ), it would probably be: prepared minimalist. That is, the Eagle Scout in me wants to be ready for anything, but the faster-lighter-lesser in me wants to push the limits of how little I need to meet this challenge. With this in mind, it was impossible for me to ignore the barefoot/minimalist shoe debate. Someone getting by with less on their feet? I had to at least do some research. Well, yesterday evening, I traded the research stage of this project to the action stage. I did a 4 mile run with Shira using non-traditional running shoes. But alas, I'm getting ahead of myself. Years ago, I saw a review on Cool Tools for Feiyue shoes, where the author suggested they were an option for barefoot style running. As the barefoot craze has increased, I kept that review in mind. And it's not just Cool Tools that likes the shoes, so does Amazon - 169 reviews with an average score of 4.5 stars. Not too shabby. Oh, and here's the kicker: they cost $19.49. For $20, I figured I could give this running craze a try. For the last few runs, I had been trying to concentrate on forefoot landing, versus the usual heal-strike that I've probably always run with. The result has been sore calves, but not much else. 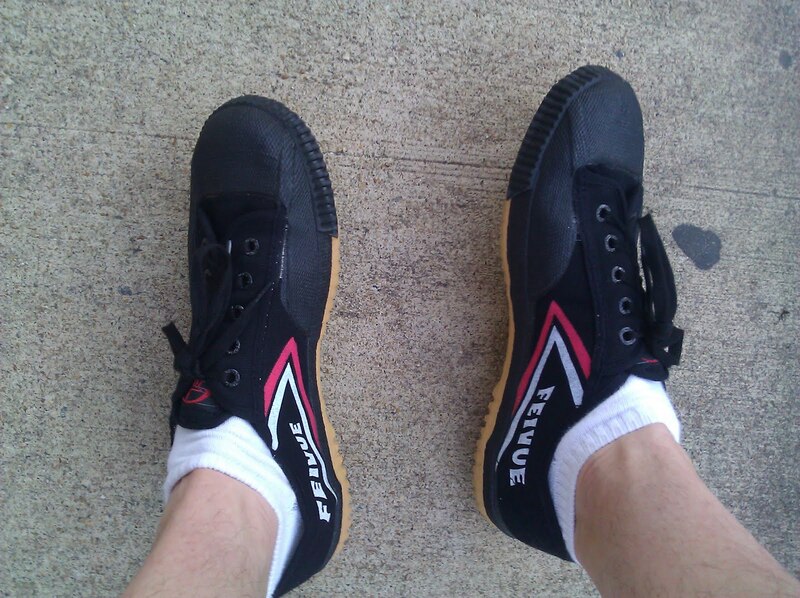 With the technique somewhat down, I figured I'd give the Feiyue shoes a try. So, how did these non-running shoes perform? In a word: Feh. One one level, it's amazing: I did a 4 mile run using $20, flat soled shoes, and lived to tell about it. 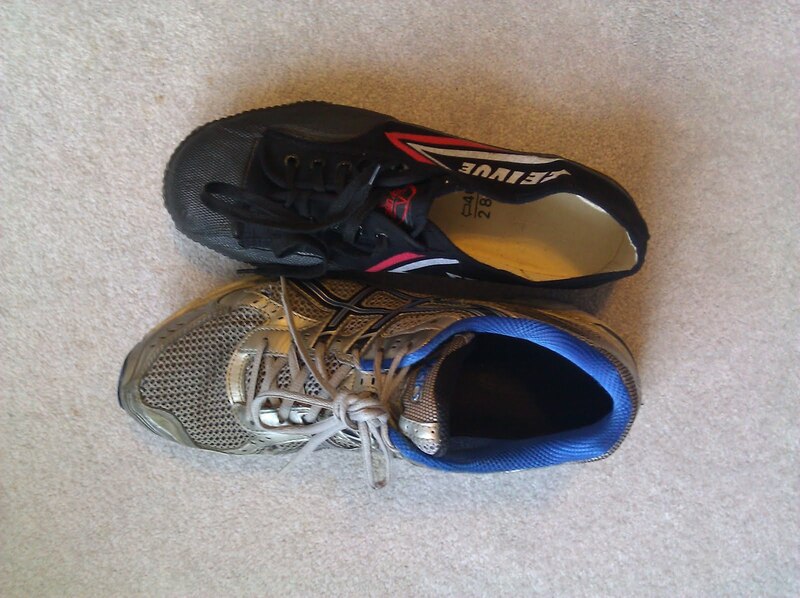 On the other hand, the shoe didn't really feel like anything different than my usual running shoes. They have visually less padding, but they weren't paper-thin like one may expect. I didn't really feel the road. They were, at the end of the day, just normal shoes. I did see warnings that the Feiyue really aren't true barefoot style shoes. If I went with Vibram Five Finger shoes, I'm sure I'd note a much more dramatic experience. At this point, I consider this a fun little experiment. 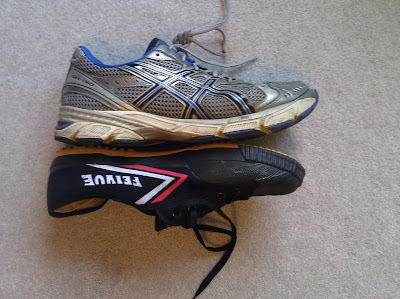 I'm interested if after a few more runs with the Feiyue's, whether a switch back to my running shoes will be dramatic. Or maybe, this is all just hype and placebo effect. For now, I don't care. It's just fun to get out and run. maybe those thick-a$$ed socks you wear dominate your experience with any shoe. the feiyues provide very notable 'road feel'. that said, the soft rubber provides a modicum of cushioning without height, but compared to your asic 201X's, there's nothing. it is not necessary to employ a forefoot strike when running in shoes that are lower to the ground and don't lift the heel relative to the forefoot. the point is not strike exclusively on the heel, which is anyway quite unnatural. just lean a little forward (from the hips, keeping the body straight up an down) and your strike will adjust. 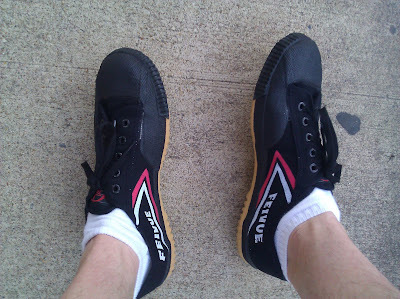 the feiyues have a very nice feel, but they're heavy relative to running shoes and the durability is low. the soft rubber wears out fast. used in conjunction with shoe goo they're a marginally better value than buying $100 minimalist running shoes. For my third or forth run, I tried the Feiyues without socks - the results were absolutely shredded feet. Worst blister's I've had in years. 6 months or so later, I've been mainly the Feiyues as my walking shoes, rather than running shoes. They (or my feet?) are worn in enough that I usually wear them barefoot and I usually enjoy the experience. Still, I'm not blown away. They are a fine pair of shoes, but I have no special affinity to them over my running or any other type of shoe.